Fish lovers unite! This weeks Julia presentation is one of my favorites. Aroma’s of the ocean with a light tomato broth. I jumped up and squealed with glee when I received the email of this weeks #JC100 presenting dish. I have a thing for sea food. Maybe it’s because I have always lived around the waters. The fresh scent captures me and when I walk into a fish market I become happy and like a kid in a candy store. I remember my 4th grade teacher telling us, “if you walk into a fish market and it smells like fish, walk out”. I will never forget that. And you shouldn’t either. But instead, fish should smell sweet and delicate. 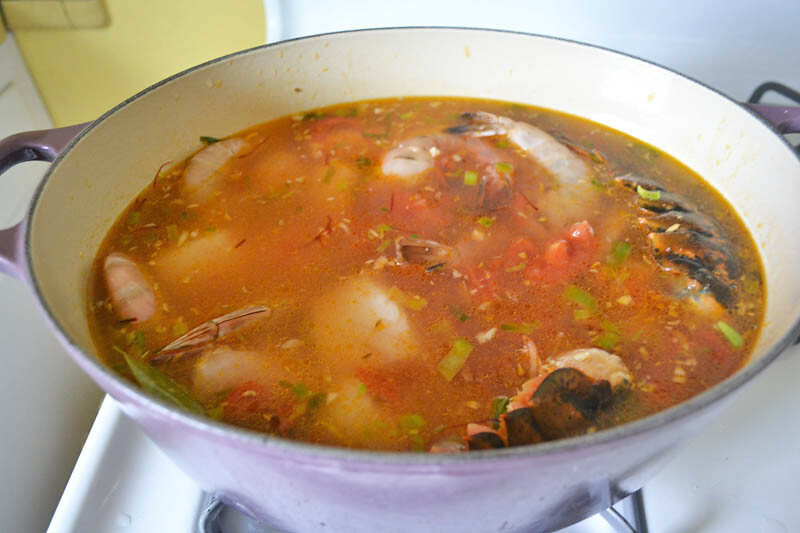 Bouillabaisse is what the fish stew is called. Mediterranean and simple in ingredients, used with whatever the local days catch was. 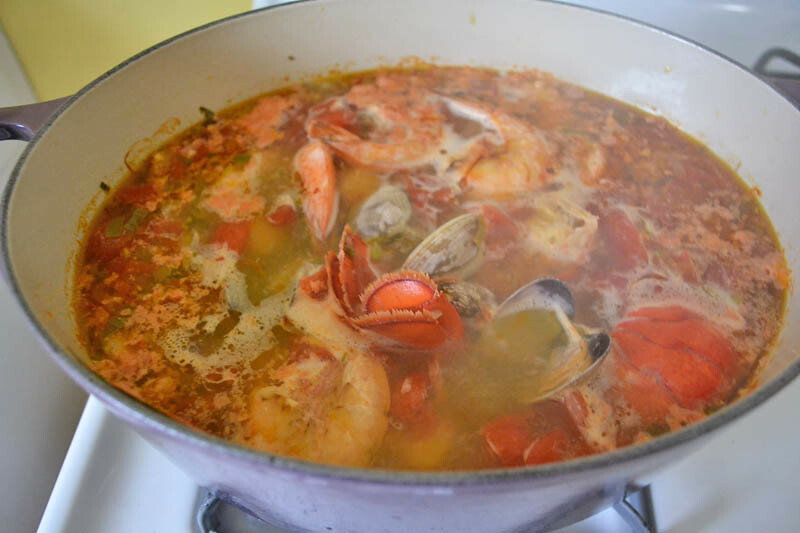 I had to do a quick Google search to find out the difference between Cioppino and Bouillabaisse since both are fish stews. I’ve had cioppino before and it also is one of my favorite dishes. An Italian-American stew that I find a bit heartier with chunks of fennel and tomatoes. Bouillabaisse however, is strained relying on a lightly red/orange tomato broth. 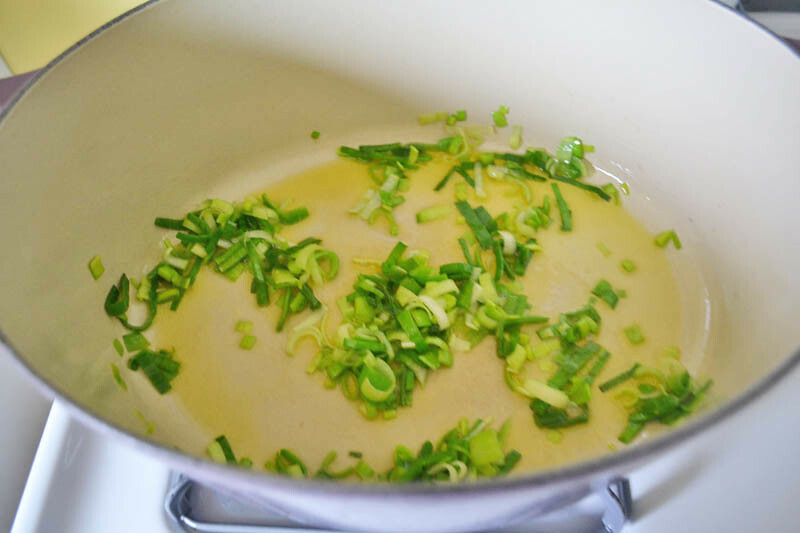 1) Saute leeks in olive oil for about 5 minutes until wilted but not browned. 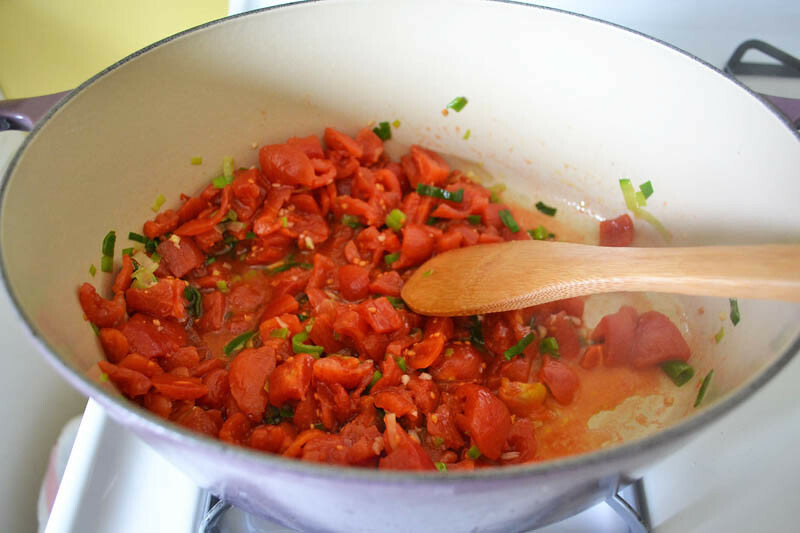 2) Add garlic and tomatoes. Raise heat and cook for a few more minutes. 3) Add about 6 cups of water, all the herbs and seasonings, orange peel and fish. At this point I placed in the larger fish first. Allow to cook at a moderate boil for about 30 minutes. 4) Add the smaller fish (clams, mussels, scallops) and allow to cook for an additional 10 minutes. To plate, plate fish and shell fish in bowl and ladle broth. Please credit the recipe with the following: Excerpted from Mastering the Art of French Cooking by Julia Child. Copyright © 1961 by Alfred A. Knopf. Reprinted with permission from the publisher Alfred A. Knopf, a division of Random House, Inc.
Saute leeks in olive oil for about 5 minutes until wilted but not browned. Add garlic and tomatoes. Raise heat and cook for a few more minutes. Add about 6 cups of water, all the herbs and seasonings, orange peel and fish. At this point I placed in all the fish but the shell fish. Allow to cook at a moderate boil for about 30 minutes. Add in the shell fish and allow to cook for an additional 10 minutes. 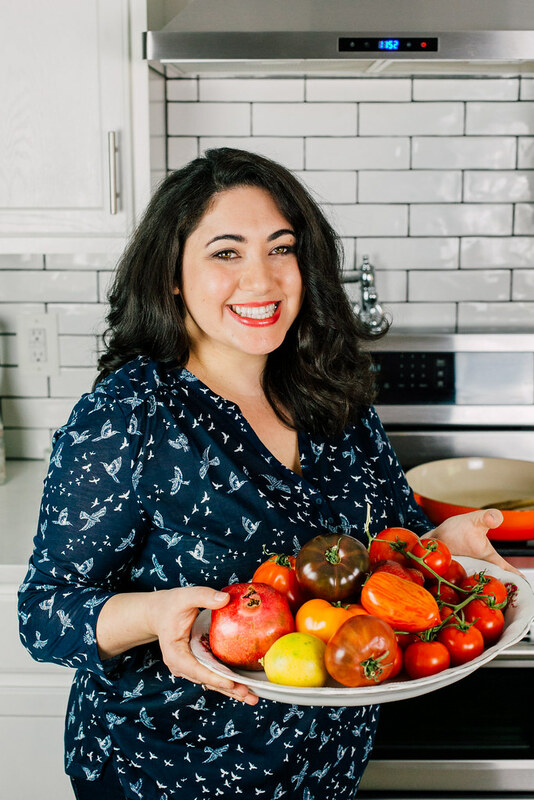 Hosting a dinner party with a Mediterranean theme? 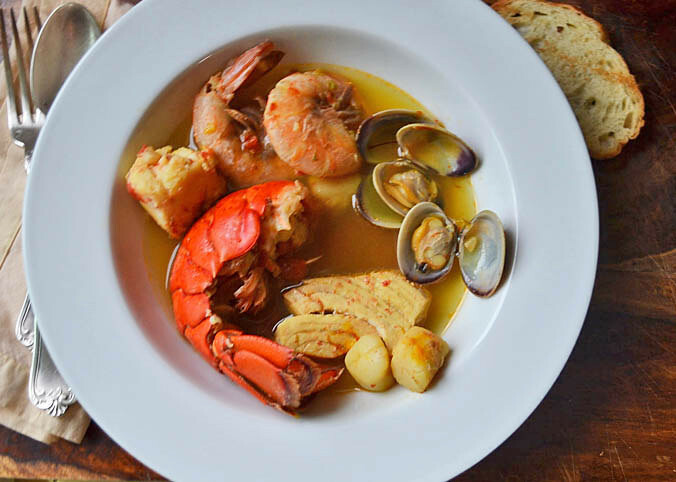 Serve this gorgeous Julia Child Bouillabaisse as a main entree and for the appetizer, tear up some crusty bread with my Italian style peppers and onions with a beautiful glass of red wine. Or if you’re looking for a more decadent French recipe, try Julia Child’s Lobster Thermidor recipe. Your photo makes it look amazing. I really think I need to re think my stance on not like shell fish! Thanks Carrie!! I do love shellfish oh so much! Oh my! I want some right now. Shellfish is so good. 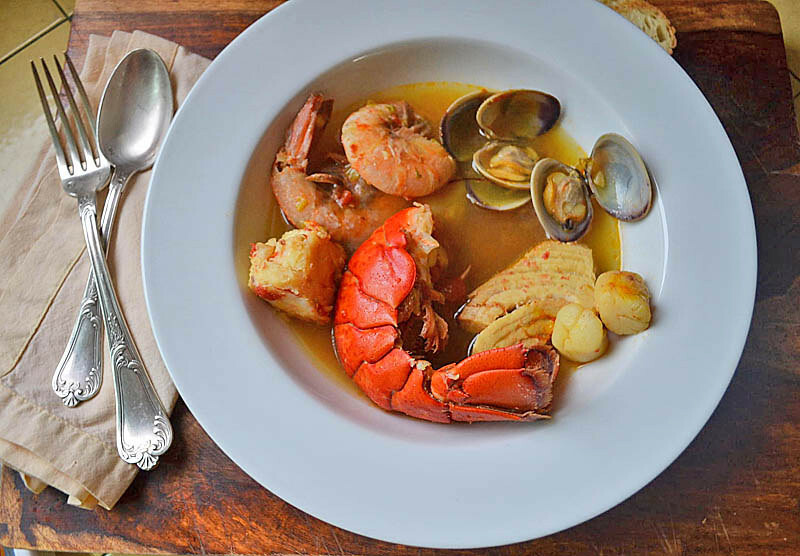 This is an absolutely GORGEOUS bouillabaisse – I want to reach in and grab that bowl! Not to knock Julia, but the cooking times for the fish are excessive. Best to start with a good fish stock, fortify with recipe ingredients shown and gently poach fish at the very end, just before serving. Also missing a key ingredient… Pernod.